Mr. Chairman, members of the committee; I am here this evening as an environmentalist with an MBA. So let’s look at the numbers. The PSC Staff Report projects that Bluewater Wind's offshore wind farm would cost the average customer $6.46 a month, or less if a proposed backup facility is built nearby. The question is, compared to what? What assumptions about future energy prices are used? The argument that the offshore wind farm is too expensive is based on unrealistic assumptions that natural gas prices will go down over the next four years, or even longer, and will remain below current prices for years to come. The PSC staff, whose work I do not wish to fault, based its analysis on energy price projections published by the Energy Information Agency (EIA) and by ICF International. 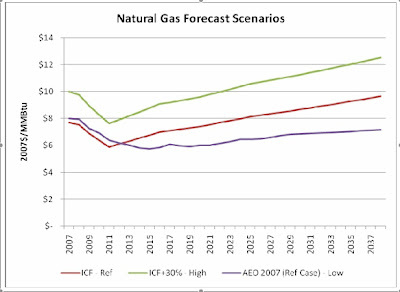 The ICF projection (ICF-Ref in the chart) is slightly more conservative than the IEA projection (AEO 2007), but not by much. The average consumer would tell you that the prospect of natural gas prices going down over the next four years, or any significant length of time, is unlikely at best. But let’s try to be more systematic in examining these assumptions. Third, the International Energy Agency (IEA), in its most recent World Energy Outlook, projects that overall energy demand, including natural gas, will increase by 55 percent by the year 2030. Increasing demand and limited supply can only lead to higher prices. Fourth, natural gas costs are expected to climb further as utilities find it increasingly difficult to build new coal power plants due to environmental concerns and the expected costs of carbon emission controls. The New York Times reports (February 5, 2008) that the slowdown in the construction of coal plants is increasing the demand for natural gas plants, which likely means further upward pressure on prices. Geologists and energy companies have known for decades about the gas in the Marcellus Shale, but only recently have figured out a possible – though expensive – way to extract it from the thick black rock about 6,000 feet underground. Like prospectors mining for gold, energy executives must decide whether the prize is worth the huge investment. In other words, the reserves will be extracted — once prices increase sufficiently to justify the high cost. The public understands that energy prices are going up and unlikely to come down, which is one reason why public comments have run about ten to one in favor of the wind project. So, who’s being naïve here; the advocates of wind energy or the opponents? It would be ironic if the General Assembly killed the offshore wind power proposal based on the mistaken assumption that energy markets will somehow work in our favor this time. Does this committee accept the findings and recommendations presented in the PSC Staff Report? Are there specific findings in the report with which this committee takes exception? Does this committee expect natural gas prices to go down significantly over the next four years? Does this committee intend to seek new sources of alternative energy outside of Delaware in addition to, or in lieu of, the proposed offshore wind farm? Does this committee believe that the objectives of House Bill 6 (EURCSA) can be met by buying power from outside the state of Delaware? Or do committee members intend to close down the process established under House Bill 6? Does this committee expect to take up legislation to repeal HB 6? The PSC Staff Report of December 14, 2007 recommends approving the Power Purchase Agreement (PPA) between Bluewater Wind and Delmarva Power because it meets the criteria set forth in House Bill 6 — including price stability. The General Assembly passed House Bill 6 in response to the sudden 59 percent rate hike brought on by electric power deregulation. And yet, the argument that the wind farm would cost too much is based on the belief that this time the magic of the market will bring about decreases in future energy prices, despite what we have learned from experience, and in defiance of all we know about economics. The General Assembly has before it legislation, House Concurrent Resolution 38, which would provide the decisive vote to approve the Power Purchase Agreement and make offshore wind power a reality in Delaware. I urge members of the General Assembly to promptly adopt this resolution and provide us with a measure of protection against future increases in fuel prices. Tom, you are my hero. I hope you didn't wake them. Three members of the committee were present and awake: Harris McDowell, Karen Peterson and Charles Copeland. When I spoke, Peterson was paying attention, McDowell was looking at his papers and scribbling some notes, and Copeland was leaning back in his chair. One of Galileo's claims the Holy Inquisition found objectionable was that the moon had mountains jutting up from its surface. To the Holy Inquisitors this was blasphemous since it entailed that the unfallen worlds of the heavens were created imperfectly; they were not perfect spheres. Galileo invited them to look through his crude telescope and see the mountains for themselves. That's what you did, Tom. You asked McDowell's Inquisition to look at the facts themselves. In Galileo's case the Inquisitors refused to look at the moon through his telescope because, they said, the Devil might deceive them and make it appear as though there were mountains on the moon. Besides, they didn't need to look. They had the Bible and Plato and that was all they needed to know they were correct. I hope you get a better hearing than Galileo, Tom. If you don't, if this turns out to be a kangaroo committee, it will be because the are relying on the unholy writ of Delmarva Power's interests as dogma. Well done, Tommy. And that comparison to Galileo by Dana is priceless. Both are exactly on point. So what did you have to do to get on McDowell's "A list." I know his staffer was calling around to those who regularly speak. After he went through his "A list" he said "we've gone through the list" and was going to close the hearing! Doing this, he shut out the regular folks who had come and signed up and was only going to allow his selected few to speak. If that's a public hearing, we've got problems here... what a farce. And it was good to hear the Delaware Nurse's Assoc. is onto the health problems associated with coal. I wasn't on McDowell's A list or any list at all, even though I had emailed earlier in the week to ask to be put on the agenda. I was allowed to make a presentation when Pat Gearity stood and asked if I could speak in her turn. McDowell wasn't happy with the way I got shoehorned into the proceedings. Jeff Montgomery, the News Journal reporter, headed downstairs at some point. From his article, one could get the impression that the public was evenly divided. But you may have noticed that wind power opponents were front loaded on the speakers' list. Well, the announcement of the meeting's protocal was clear: get on the list ahead of time or you may not get a chance to speak due to time constraints. Governor Peterson and Chad Tolman were the first speakers then good old (and extraordinarily frumpy) Ed Ratledge was second ~ heavy on the RAT ~ he is a useless tool who was bragging about his seat on DEFAC ~whoopee. The folks who used up their precious minutes complaining that this was a set up put my teeth on edge. I guess it was useful because it did make it into the paper. I read it that Montgomery didn't even present it as an evenly split crowd, IMHO. He quoted pretty much each of the few people who voiced objections to the PPA's going forward and not much at all from those thirty some who favored the PPA's going forward. There were a few speakers who stood out. Frieda Berryhill: because she presented a body of information that directly countered some of the lies being told about wind farms world wide. And Tom Noyes, of course. Many echoed what I said about the Enron-like set up we are subjected to by the de-reg aggreement. I asked that they revisit regulating the utility and that they all reveal what financial interests they have in any of these PEPCO entities. A lady named Nancy Feichtl was extremely powerful. I am going to put her comments online ASAP. Allen Muller also gave a great presentation because it was so historically grounded with the mess these people have been making . I am at a loss as to why Willet Kempton did not appear while his fellow UD faculty, Charles Boncelet did (tool that he is). To be fair, Tom, Pat Garrity spoke for Nick DiPasquale early on. When we realized at the break that you hadn't gotten onto the pre-prepared list she offered you her spot and wanted the chance to speak later on. It was aleady 9:30 and my sense of McDowell's hesitation concerned his trying to tell her that she may not get the chance to speak later on because of the time constraints which she then said ok to. I am going to read the above link now. It sounds like something that needs to be posted on the Delaware blogs. The premium between 5% and 25% offer by WGES has bounced from $4 to $5 to $4/month recently as their new 2008 offer was posted, and prices went up 3.6% (13.9 to 14.4 100% wind). To hold the line to these costs, spreading BWW to Delmarva retail would remove any additional costs due to the purchace of more than the 17.995% required by SB-19. Now, Hocker/Copeland et al want to follow DPL montra and spread project to ALL DE including DMEC and Co-op. They were allowed to opt out of SB-19 requiments. Industry was exempt. This accomplishes nothing in the way of cutting SOS rate costs and provides even less SOS price stability. It drops BWW from 7-10% of SOS power to 3-5%. That remaining 12.995-14.995% still has to come from somewhere.